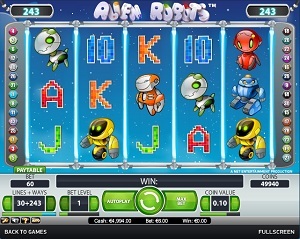 Alien Robots is an out-of-this-world online video slot game launched in April 2011 and is offered exclusively at online casinos powered by Net Entertainment. This online video slots game has 5 reels and 30 pay lines, plus you have 243 bet ways to win per spin! The theme of Alien Robots is, of course, all about robots from outer space.This slot game features different types of alien robots and it is set on a starry blue sky. This slot game can reward you with up to 50 free spins when you hit 3 or more Scatter symbols. It may look like it’s going to be a long night on this slots game, but the game play is absolutely entertaining as they happen to have Sticky Wilds! The Sticky Wilds expand in order to cover the whole reel, and they remain there while the other reels spin again, to help you get a chance on winning the bigger prize!The Alien Robots online video slot game can be played instantly, and you do not need to initially download it. With futuristic graphics and sound, free spins, expanding sticky wilds, scatter pays, the chance to win up to a max jackpot of 50,000 coins, a max jackpot of $25,000 in cash, 30 pay lines, and 243 bet ways to win, Alien Robots is one video slot machine game that you definitely should try out! Even if it has just been a few months since it was released, Alien Robots has been designed more on the retro side. Enthusiast slot players say that they definitely feel nostalgia flooding through their minds when they play the Alien Robots slot game, but this one is much better than others as it has more modern features and many great perks such as the opportunity to activate 243 bet ways to win plus the 30 pay lines! The setting of this online video slots game is on a starry blue night sky, as it is the usual scenery for unexpectedly spotting alien life forms that we see in sci-fi movies. The symbols are drawn in a colorful yet simple manner, so your eyes will not get tired from playing this particular slot game. The overall graphic design of Alien Robots showcases different colors of red, blue, green, yellow and orange. Alien Robots has sound effects that will make you think that you are in the vast outer space. The usual robotic sounds that you will hear are very much like the sounds created by R2D2 in Star Wars. The background game sounds that you will hear are those made from a hovering alien spaceship. If you would like to experience a futuristic yet with a touch of retro-type online slot gaming experience, play Alien Robots and see if you can nab that sweet jackpot of $25,000! The regular symbols are the card deck symbols which are 9, 10, J, Q, K and Ace. The other symbols include alien robots such as the red Baby Robot, the orange Butler Robot, the yellow Security Robot, the green Dog Robot, and the blue Construction Robot. The Wild Symbol is the Alien Robot (the one with the green brain). It can act as a substitute for other symbols in order to help you complete winning combinations, with the exception of the Scatter symbols. The Scatter Symbol is the Alien Spaceship. If you hit 3 of the Scatter symbols, you are awarded 10 Free Spins; if you hit 4, you are awarded 20; if you hit 5, then you are awarded a load 50 Free Spins! The Bonus Feature, activated when you hit 3 or more Scatter Symbols (Alien Spaceship), awards you with up to 50 Free Spins! If you hit 3, you will be rewarded 10 Free Spins. If you hit 4, you are awarded with 20 Free Spins. If you hit 5, you are awarded a nice sum of 50 Free Spins! When it comes to Free Spins, Alien Robots is a really munificent video slot game! The Wild Symbol (Alien Robot) will substitute for the Scatter Symbol (Alien Spaceship) in order to complete winning scatter combinations and/or to trigger the Free Spin Bonus Feature game. Once the Free Spins have been activated, if you manage to get the Wild Symbols (Alien Robot) on winning bet lines or bet ways, you will also activate the Expanded Sticky Wild feature. The Sticky Wilds expand to cover the whole reel and they stay there while the other reels re-spin, giving you the chance of getting much bigger wins! The Expanded Sticky wilds resume back to the usual Wild symbols after 1 re-spin. When the Alien Robots Free Spin Bonus Feature game is over, you are taken back to the regular Alien Robots slot game and your Free Spin bonus game wins are added to your total win. Alien Robots has 5 reels where you may bet on 1 to 30 pay lines, or you can choose to play 30 bet lines with 243 bet ways. This simply means that there are 5 reels available from which you can form your winning combinations. For each and every coin you put in, you enable another pay line. When the reels stop, the combinations of symbols along each enabled payline are checked by the computer. The minimum bet is 0.01 coins and the maximum bet is 0.50 coins per line. Alien Robots can be played automatically for a certain number of spins, thanks to its Autoplay function. You can customize your Autoplay by clicking on the Advanced Settings button. You can Stop Autoplay: on any win, if Free Spins is won, if single win exceeds a certain amount you input, or if cash increases/decreases by a certain amount specified by you. When everything is all okay, simply choose the number of rounds that you would like to automatically play and press Start.